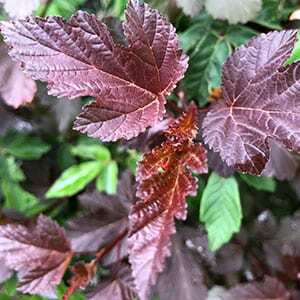 Dark foliage plants are must in any garden, they depth and contrast and Physocarpus opulifolius ‘Diabolo’ is a great choice. It is easy to grow, requires just a little pruning and flowers as well. This is a plant that has a natural arching habit, and it tends to look a little graceful in a dark sort of way. The foliage is best described as maple like in shape. It is fast growing and adapts to range of soil conditions as long as it has a little moisture over summer. 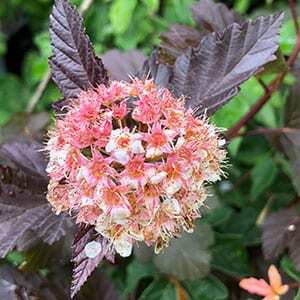 As Physocarpus opulifolius ‘Diabolo’ will reach around 3 metres (9ft) in height it makes a very good background plant. However it also has interesting bark that peels in layers, hence the common name of ‘Ninebark’. Once established this is a reasonably drought tolerant plant. Choose a position in full sun to some afternoon shade. Dig the soil over well adding some compost and cow manure. Plant at the same height it was in the container. Backfill and water in with a liquid seaweed fertiliser. This is a multi stemmed shrub and best left with individual canes to grow an naturally arch. After a few years you reduce them in lenght by 50%. You can also remove some of the older canes to help the plant regenerate.